Nothing says "Italian summertime" like a platter of crisps crostini slices topped with a fresh-tasting and flavorful bruschetta. Like a chimichurri, the bruschetta topping is an uncooked sauce that can be used on meats, bread, cheese, or whatever dish you'd like to add a burst of freshness to. The recipe below is quick, easy, and doesn't require any cooking, apart from toasting the bread! Even our non-meat-eating friends will be able to enjoy this delicious condiment, as nearly all bruschetta recipes are vegetarian or even vegan-friendly! When the plump and sweet cherry tomatoes combine with fragrant shreds of basil, minced garlic and high quality extra virgin olive oil, you have a recipe that can transform even the blandest of dishes into a journey to the heart of Tuscany! In a large bowl, combine the cherry tomatoes, minced garlic, basil, balsamic vinegar, and olive oil. Season liberally with Kosher salt and black pepper to taste. Mix thoroughly to combine. Cover with plastic wrap or aluminum foil, and allow to marinate outside of the fridge. 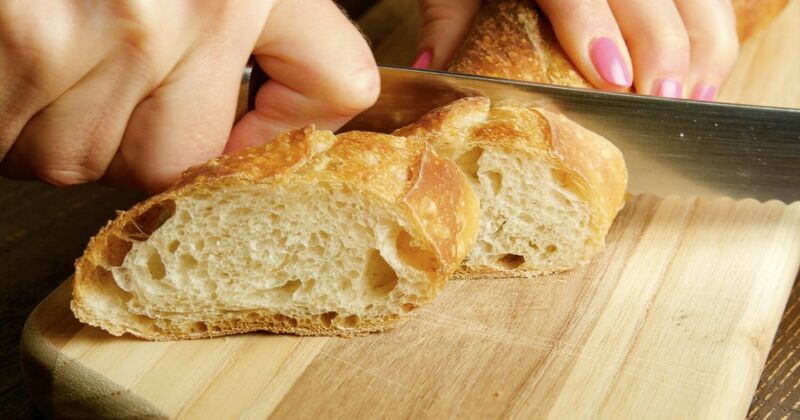 Slice the bread into 1/2-inch thick slices on a bias. Arrange the bread slices on a baking sheet, and drizzle them with a little more extra virgin olive oil, or rub them with a garlic clove (optional). Place the baking sheet in the oven, and bake until the bread slices are lightly browned and crisp on the edges, about five to seven minutes. Remove the bread from the oven, and allow it to cool. Once the bread is cool, spoon a liberal amount of tomato mixture on top of each crostini. Garnish with a little extra basil (optional), and serve immediately on a platter to avoid getting the bread soggy. Pro-tip: Have extra time to spare? The bruschetta mixture will only get more delicious the longer you allow the flavors to blend. You can marinate the tomatoes for up to four hours! 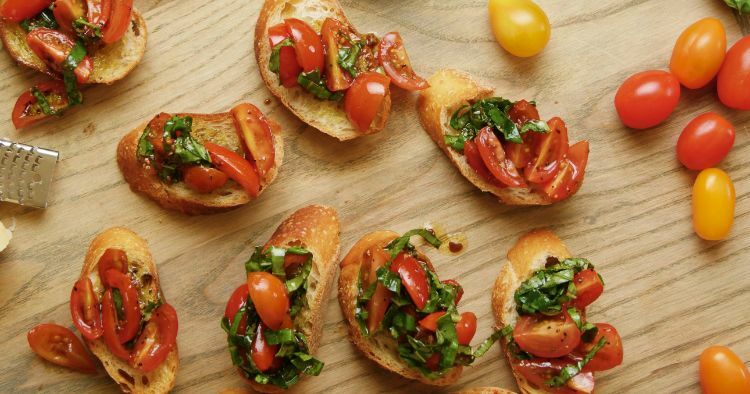 Pro-tip: Prefer a juicier bruschetta? Use larger plum or Roma tomatoes for extra tomato flavor!